diff-colorize is a simple utility that syntax-colors and syntax-highlights unified (diff -u) and git-style (diff --git) diff output. The default settings require an xterm running in 256-color mode. To achieve this, set your TERM environment variable to “xterm-256color”. Apple's Terminal does not support 256-color mode. You will have to use 16-color mode. The default TERM value is xterm-color, which means that you are already using 16-color mode. You can customize the colors by setting variables in your environment. Run the program with no input for more information. The Python program and BSD-style license, in a bzip2-compressed tarball. Detached PGP (GPG) signature of diff-colorize-1.0b2.tbz using public key ID A54AE2A6. Detached PGP (GPG) signature of diff-colorize-1.0b1.tbz using public key ID A54AE2A6. MD5 and SHA1 signatures were created using OpenSSL 0.9.7l. Added support for Terminal and other 16-color terminals. 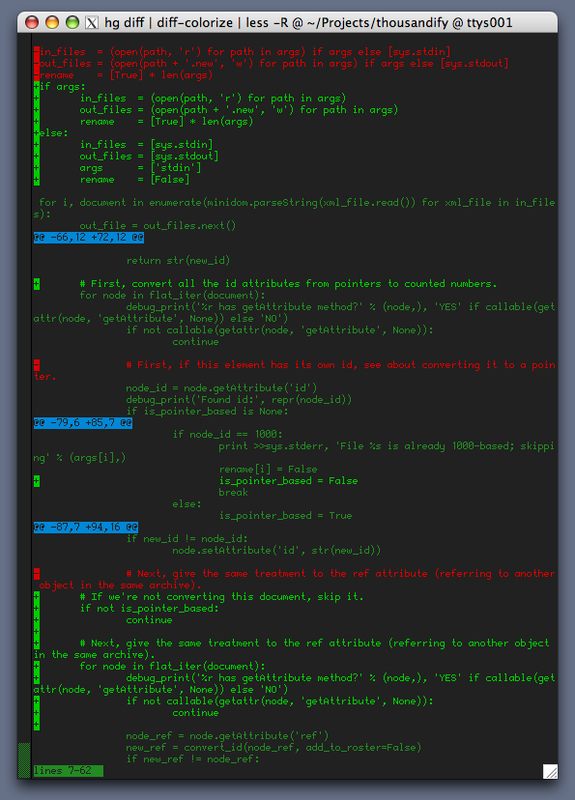 I provide diff-colorize—the application, and its source code—under a three-clause BSD license. For more information, see the file named LICENSE.txt that comes with it.